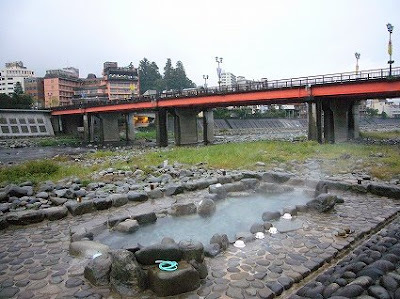 Only five minutes walk from Gero railway station of JR Takayama-line, the Funsenchi （噴泉池）or spouting spring pond, a symbolic open-air bath of Gero onsen lies just beside Masuda river. Although there is no changing room, swim suites allowed for ladies. Admission free. Needs boldness, not money. Supposed available anytime anyday, but when I visited early morning in March 2008, the tub was almost empty as shown below. There is a basic restroom under the bridge. 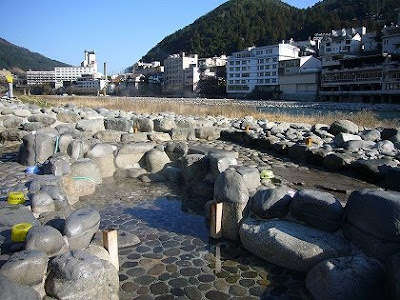 Gero onsen is in Gifu Pref, Tokai Region. It takes about an hour and half by express train from Nagoya to Gero. Hello, you said that the requirement to wear swimsuits is in transition now; are you referring to ALL of Japan's onsen, or only Funsenchi, Gero Onsen? Also, from what source did you hear this? Please reply! Thanks very much. 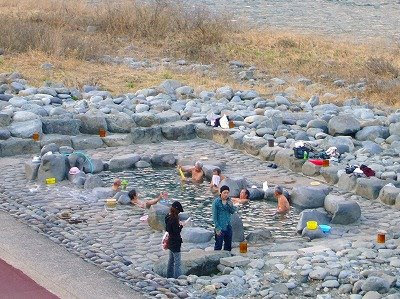 Birthday Suites Bathing is banned for only Funsenchi, Gero Onsen. Please translate following page as I can't find news source in English.